Opening next friday, the 10th of september, every body welcome in the castle. Here follows why I chose to not paint the castle and let it be overwhelmed by nature. As I’m at it i’ll try to put into words what is the link between the different parts of my work. At a first sight it might seem somehow incoherent, but all these fragments do have a clear connection. I juxtapose drawings, paintings, wallpaintings, phrases. I let the viewer be part of the work by asking his opinion, by letting him build a story between the different fragments, by making him walk through fields and discover another side of the farm and another side of himself. In the drawing you often find a continuous line, it’s a deliberate break with the perspective as taught in the western world. But it’s more. It also draws interrelations between the different elements. For example, if i would be drawing you, my line would follow your contours, go right inside and follow the chair, the room the plant or whatever that surrounds you. To draw our link with our environment. Everything is related to each other. By looking at something you are already changing it. The mere observation of a cell will influence its attitude. Your thoughts influence your being, the way you move, and also how other perceive you. These concepts have also been widely studied by quantum physics. The energy you have, the energy you radiate, also interferes with your surroundings and beyond. So i adjust the medium according to what best suits the purpose of what i want to express. A lot of values i embrace come from the buddhist tradition. I try to translate the way i face the world in the art i make. And ideally the viewer might get more conscious about some aspects of life i’m pointing at. 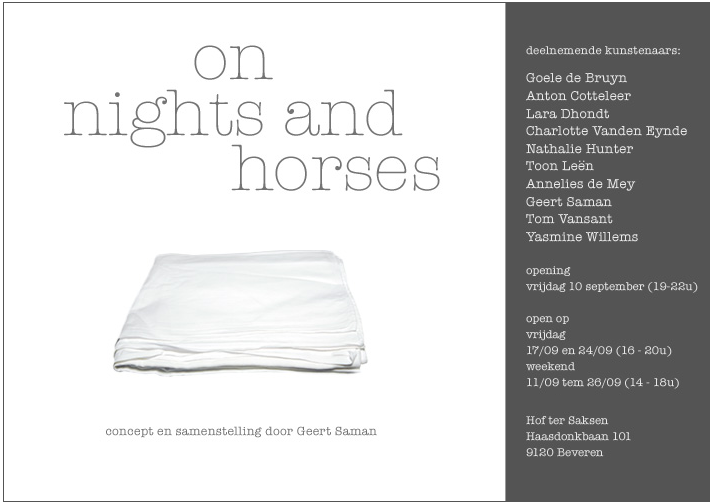 In the case of the work i made for the exhibition “on nights and horses” i thought a lot about the differences between outside and inside. About the people that built castles to show their power and about governments restoring past glories but letting the inside rot. Rotting so much that the scent in cellar is overwhelming. Rotting so much that different plants are growing in the building. I also thought about today’s obsession with appearance. Beauty and youth are far more important than experience and wisdom. Yet i believe that most of today’s problems come because we’ve lost the link with ourselves, the link with our neighbours, the link with the changing rhythms of seasons, the changing rhythms of our bodies. So yes, i do find this interrelation of uttermost importance, decided to draw the castle from the side, and made a painting from it. I didn’t paint the castle. I painted nature overtaking it. Are you my cousin from Kapellen with whom I grew up with?